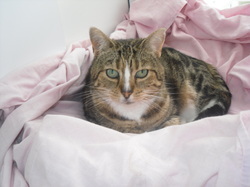 Hi I am Bubbles I am a tabby/ tortoiseshell domestic shorthair. I have been at Country Hill Animal Shelter for 2 years now and am in desperate need of a loving permanent home where I can thrive. I would like to go to a home where I can be an only cat without any other animals, and also with no children because I like to be the centre of attention and can get grumpy otherwise. I can be quite timid however once I get to know you and trust you I am very friendly, and most definitely a lap cat. All our cats are checked over by the vet, vaccinated against cat flu and feline enteritis, neutered, identity chipped and treated for worms and fleas before they are re-homed. If you would like to visit Bubbles please contact us to make an appointment.